I have dropped my iPhone 4 last week from my pocket. The problem is, since that happened, the back section of the iPhone, heats up and gets very hot. The heat is on the right side of the phone (where the rear camera is). This results in the battery draining VERY fast. With just some casual safari browsing, the battery falls by about 10% - in just 2-3 minutes. When charging the phone is EXTREMELY hot. The rear camera, also suffered a shock, and the focus motor does not function any more. The exterior of the phone stayed perfectly fine, but I fear that there is some sort of short circuiting within the board. (cannot be the battery, as it does not get hot). Does any body have any idea how to check for short circuiting within the board? If you have any suggestions please help! I'm having the same issue. Simian, if it still heats up with all the screws out what does that mean? do one thing remove all the jacks means remove camera , power button , front camera. for checking just put the lcd and touch jack on the logic board not any other and one charging jack and the battery also. then try to power up with usb cable. after powering up remove that also . then use it for a while if still heats up then it looks like your logic board or battery is bad. then try with other battery . still same then last option to repair the logic board. Simran, thank you! Your solution worked. My iphone 4 started to heat up rapidly, especially on the top right hand corner, near the camera, which resulted in the the battery draining out in few minutes. My phone was out of warranty so I decided to take it apart and reseat everything. I removed the logic board, removed all the dust inside and reseated all the connections. Some of the screws holding the board to the metal chassis was loose. where did you take it? to your service carrier or apple dealer? This was my problem too. I took the camera out and it seems to be working fine now. I'll give it a day and then if it's still seemingly good I'll order a new camera. Chris, that's correct. The phone can work without the camera. similar problem: overheating as above, and after about a month the logic board died completely. i bought another phone (older and with many signs of wear), swapped the board - same issue. swapped the battery - same issue. seemingly must be some other component. the camera suggestion from Linda gives me some hope - was it the big, rear-facing camera? i will check this. any other suggestions? would love not to test components one by one. if this doesn't work change the rear camera ! how to reset all setting? i can confirm replacing the camera can rectify it. even after a restore the iphone 4 was running hot (even power button felt hot!) and massive battery drain. there was a tiny chip on the front screen by power button indicating a fall. Have the same problem in a water damaged iPhone 4S here at the mo battery drain went from 87% to 64 in 45 minutes and phone was not being used was only in lock mode..
Charged battery to 87% again and used battery in another 4s an in 1 hour battery dropped to 79% and that was being used a few minutes on Facebook. hi all just an up date have tryed everything with this 4s and still really bad battery drain even disconnected every connector on the motherboard and still no help. Any solution to fix the motherboad? In my case Linda was right. I just opened the phone, remove the faulty camera and now the device works like a charm. Until you mention it I haven't notice that the camera can't focus correctly (I almost never used it). I have just ordered the camera replacement, but in the meantime I can live without it. Thanks. so it is possible to use the iphone 4s without the camera plugged in? just wanted to report that it was not the camera. Is it maybe a battery problem? 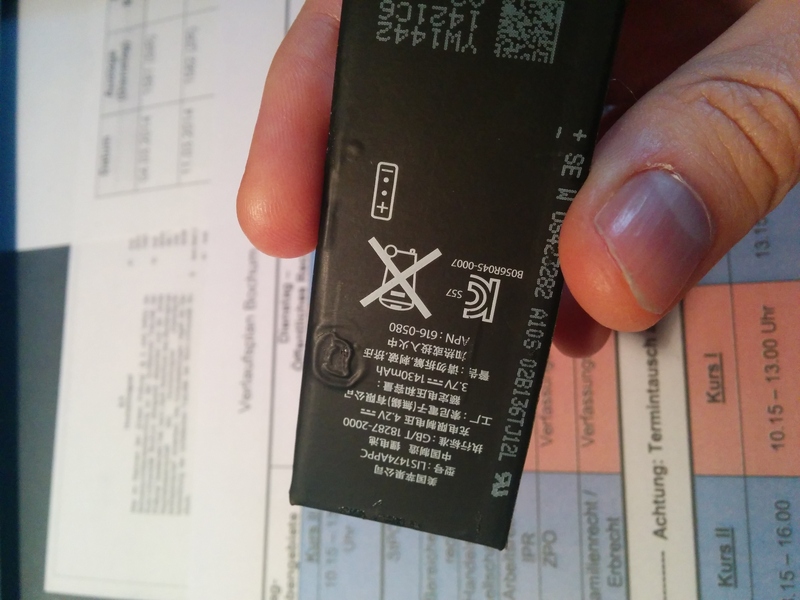 The battery has a weird "hole" on the backside, could this be the problem? You see the image within the attached link. It gets hot and battery drains very fast even if i dont use it. I had the same problem and I toked out the camera and the phone works perfect. i also the same problem what i do ? i dropped my phone about 3 weeks ago and shattered the screen. when i got it replaced i was told that the motherboard was messed up and so far my screen has been slowly breaking (the touch doesnt work in certain spots). im just curious because my phone has also been heating up and the battery has been draining really fast (today it was at 68 and i had the screen locked for 30 mins and it went down to 30%) i honestly dont think the heating and battery draining is because of the motherboard so i was wondering if anyone could tell me if the camera thing should work? Sam wird auf ewig dankbar sein.